Zalman is not one of the big names when it comes to creating pc towers, but they have created something special with this one. I recently upgraded my case because I needed more room for better airflow, which I just didn't get with my smaller, more compact, Cit Vantage Midi Mesh Case. I opted for the Zalman due to the low price and space potential. It supports up to 7 fans, which is great if you intend to overclock your graphics card. 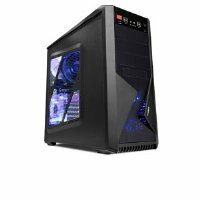 I have listed the product descriptions below, and compared the Zalman Case with my old Cit Vantage Case to give you an idea of comparison with the 2 cases. Product information: Zalman ATX Mid Tower Case. Product information: Cit Vantage Midi Mesh Case. As you can see from the dimensions, the Zalman was more spacious and exactly what I was looking for. It came with 4 pre-installed fans, with the option to add another 3, helping keep the temperatures down to a minimum. With better cable management it helped me keep the wires neat and tidy, keeping good consistent airflow inside. It also comes with a temperature reader on the front panel, helping you to see the temperatures the inside of your case is generating. To be honest, it's hard to fault this case. It has provided me with everything I needed on a budget as well as plenty of space, airflow and style . So if you're looking to upgrade your case on a budget, you can not go wrong with the Zalman.